This app is awesome, and a great way to lot your creativity fly. Can’t paint the 4.00 version! Very frustrating! Help requires too many boxes to type in. I want my money back! I loved this app till I was 7 then i forgot about it. Then one day my brother went up to me and said remember this app? now I CANNOT STOP PLAYING IT!!! Play this game!!! Bring the daily challenge back! I love this app but please bring the daily challenge back. This app is interesting and challenging it’s different. It’s a good app it has a lot of challenges. It pushes you to do better it’s fun to make virtual cups , pots , & etc. . . I signed into a new phone and everything I paid for is gone. I tried logging out of Game Center and signing back In but I got nothing. My game is here but nothing Else I spent money on. I bought almost everything. Definitely disappointed. This is a really fun app, very easy to waste hours. It does need some type of gallery so we can see our finished products in the app itself. Sure, I can take photos and send to friends, but a gallery in the app would be great. Just a photo collection or maybe even a virtual art gallery displaying our creativity. This game was never that good. It had good graphics and a creative idea that is fun for the first few days of owning the game, but then it turns repetitive. The first few days of having this app I was addicted to it. It was relaxing to an extent, and it never made me bored. But after a while I realized that I was stuck and bored. Every time I opened the app I treaded playing it. Why? Well first of all, all of my pottery that I made was now selling at the same price (close to 130-210.) The other reason why I got bored was because how thin the game was. There were only a few things you can make, with only a few amount of patterns, and colors, with only a few amount of total designs. This is disappointing because where I’m at in the game currently it feels like there are no more achievements, just getting a few things every once in a while. I don’t want to have this app until I am amazing at it and I can’t do anything at all as well. Even though I’m giving this 2 stars I do suggest this app to some people who won’t get bored easily, but remember there is a time where achieving things are impossible. Suggestions: Add a level system. Each level unlock different patterns and colors that you can purchase. 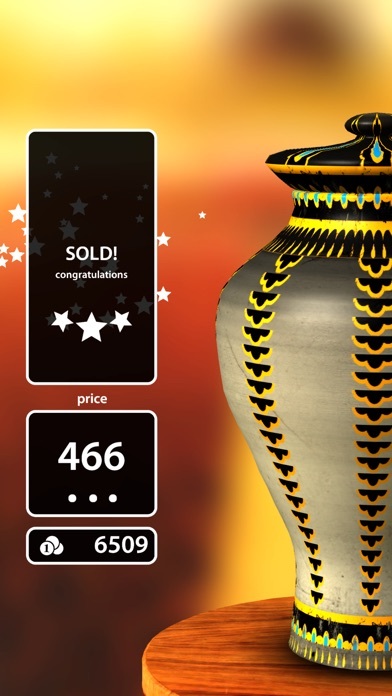 The higher the level and the amount of money the more expensive the pottery should sell for. What happened to my brushes? For a few month I played this game regularly. I loved it enough to purchase all of the content. But got bored after a bit. Recently I went back to it looking for the same enjoyment. But instead my brushes are all gone. Like others I Amon the same account and have restored multiple times. It will not even let me see the different assignments that used to be available. What has happened? I love this app, it’s so fun to create and it is SUCH a stress reliever. I love buying all of the new patterns and materials. My favorite part is painting and decorating my creations. When I sell them, it can go from $5 to $2000 in a snap! TOTALLY RECOMMEND. I used to have everything.. and paid for designs. When I hit restore, it says it’s been restored but it’s no where to be seen. it is exactly the same as the lite version. which means you get nothing, no brushes or colors. if you want to contact them you have to join facebook. no thanks. just get the lite version. It does nothing more than the free version. I like to get a refund. Amazing game! I've been playing for years. So fun! I've bought EVERYTHING! I would like if we could have more colors for free. White, brown, gray, and a few darker colors would make my pots look better than they do. How can I buy more! I bought the premium package and cannot access it. How do I get it? Very fun to play and to relax. Keep selling to buy more decorations. Great way to relax and unwind. Just you get a lot of brushes unlocked when you purchase the app. I only wish that more colors came unlocked and you didn’t have to pay more money for them. I LOVE THIS GAME AND LET NOBODY ELSE TOUCH MY PHONE BECAUSE I AFRAID THEY MIGHT WASTE MY COINS!!!!! POTTERY 4 LIFE!!!! This game is addictive. The support is awesome. I had some issues and sent an email and they helped me fix it right away. One of the best apps I have ever used. Is so fun and cool I love it.is the best app ever.👌🏻👌🏻👌🏻👍🏻👍🏻👍🏻👍🏻👏🏻👏🏻👏🏻 Please let me know if there’s any new information about the app. I was skeptical at first, I got the lite app to try it out, I found myself buying the upgrade quickly. I love the realistic look, especially right after firing the clay, no marks or cracks in the sculpture ever look the same, there is so many cool patterns you can make even using the same brushes and slightly overlapping them to change the look! The only thing I wish you would do is make the shaping a little more intricate so I can make smaller and more indentures in the sides to make more interesting pieces! But anyway, great job on making a cool time passer! This app is awesome! It’s amazing how relaxing and calming it is. I have had many versions of this app and it’s always been so good! Mainly, there are no problems, only one is that doing quests don’t give you enough money when you buy the Brushes and Color, say I got a 500 coin item and I have to buy it for a quest, but I only get 300 or 350. But still I love it, making vases is my dream! Just my review so yeah, Thanks for this awesome game! Next time that they update this game they need to make up some more pottery emails so you get more challenges, other than that the games pretty fun. I don’t typically do reviews but ... hey why not. I saw my friend playing this game and honestly even still this app runs so smoothly like a well oiled machine and I’ve never had trouble so I I’m sorry if this app does not do the same for anyone😀. I love this app. I spend an hour a day (or more) making pots. It’s amazing how real everything looks. My only complaint would be I can’t seem to find several patterns such as Chinese II. It isn’t available in the premium in-app purchases. Maybe someone here can help ME? Please? Paid for some extra colors and some other premium content. It’s not anywhere I can find. LOVE LOVE LOVE THIs!!! It inspires creativity, so fun for all ages from my 10 year old daughter to myself! I rarely ever pay for games but this one was totally worth it! This app is so awesome. I got it as a stress reliever and it is perfect for that. There are so many details you can add and ways to customize. Relaxing and fun. I love this game but I think you should add glass material and some more fun designs. I also thought you could let the people that play this game make like silverware and plates and bowls and cups all that kind of stuff. Well hope you do it thanks. I thought this was going to be super fun and I was a little hesitant to spend money on an app, but I thought it must be worth it. It wasn’t! There was so little to do and it wasn’t even fun. I ended up deleting it after 20 minutes of trying to see if I was forgetting something or doing it wrong. I wasn’t doing anything wrong. It wasn’t advertised good either and I thought it would be different then it actually was and I’m still confused why it costed money when I could get a free art/pottery app that is better. Long story short don’t spend money on it, I’m just trying to save you 5 dollars. It isn’t exactly just a for fun art app either, I think there was some why to purchase or sell your (awful/simple) creations but idk if it was real or not and like I said it was just confusing and not what I thought it would be. Meditative. Relaxing. Calming. Buy the upgrade, trust me you will love it. Zen friendly. Honestly I don’t tend to buy apps because I don’t think it’s worth the money but this has been worth every penny. It is so fun and relaxing. It allows me to explore my creativity in a delightful way. I definitely recommend it to everyone. I am totally addicted. I use this game all the time to calm myself down, and it works without flaw every time. I love this game. I definitely recommend. Although there is one glitch: I’ve finished all the quests, and this Polish pottery keeps on appearing on the side of my screen as a quest, but when I go into the quests log, it shows I have no more quests. But other than that, this game is awesome! All right, I will start with good stuff. I love this game!! It is very addictive, and fun! Express creativity, and you can play it whenever, because it saves the design from when you last played! Great price for great game! But, when you buy the ‘not lite’ game, then you expect to have a better game experience, right? You don’t have to buy thing with real money, because you payed for the game with money, right? WRONG! They recently added a bunch of packages with different designs. WHY? Why can’t the people who didn’t use their money to by the lite version have to deal with that? We payed or hard earned money to get the full version, just to pay some amount of money to get these certain designs? Unfair. But, alas, don’t let that ruin your purchase, because you still have a nice amount of designs anyway. Fix that, for me? First let me say, I do not know much about pottery; but, I find this app very enjoyable. I am slowly getting better and will continue to work at it. I find the app helps me relax after a stressful day at work. I enjoy the app, it’s relaxing to use and fun to create. Suggestions for improvement: more colors, brushes, materials. A gallery where we can save our creations. More challenges! I’ve done them all already. I love this game so much! It WOULD have 5 stars, but I’ve completed all of the story requests (and there weren’t that many...) and now I can only do daily requests, which is fine, I like those too, by I LOVE the challenge! I also like just creating and making my own stuff, but I’d like more of a balance... CHALLENGE US!!!! Please!!!!! The game is really fun and addicting but some of the orders that you can make are hard to make perfect and get a good rating. I was looking for a fun stress reducing and creative game to play. This game hits the mark! I went ahead and bought the full app and I'm not disappointed with the selection of materials and patterns I'm able to buy. Yes, there is a challenge of filling orders if you wish. I, however, love that I can simply create pottery earn money and buy more supples to create more pottery with.😄 My only critique is that I wish they would develop more tools to use during the throwing process. Mostly I find this game very, very satisfying. First of all, it’s an amazing game and is don’t regret paying for it, but I have a few questions (and suggestions). How does the system for bidding work? I think we should be able to bid and possibly collect pots. Maybe we could even buy plain pots to paint, or see models for inspiration. AWESOME game but there are some improvements to make. When you complete the game what are you going to do? Earn money? No you are going to delete the game. I got the “Lite” version to see if I liked it and I did, so I moved 9n to the real version... after that I said, “Yay I’ll get all my previous things and more,” well I was wrong ‘bout that, I lost EVERYTHING and I’m still working on getting more. But overall the app is fun to play and super relaxing. I just tried it out because I like being creative but I actually like this game a lot. So much that I bought it, and I don’t usually pay for phone games. Thanks! I've played this game before, and WOW did it change! This is due to the challenges i've never seen before, since my sister played before me. And i never check my inbox. It should be called mail. My Aunt Chloe ( who i haven't met, nor heard of,) is very nice and helps me make some money! I also like this game because it DOESN’T MAKE YOU PAY OR DOWNLOAD PREMIUM!!! At least, not with the update, i like the older versions better. This is a great game to play when your bored. But for me, it's forgettable. Probably because i have a lot of apps. One thing though. Is there a thing where you can compeite against other people in the world? So then, at the end, even if you don’t win you'll win some coins. The winner gets more coins. If there is already one, than okay, if there isn’t, that’s one more thing to think about! Or you could make more colors avalible. Otherwise, i’ll be addicted forever. That doesn't make any sense. You get it, right? I love this game but I really wish there were more quest. I find myself getting bored knowing that there isn’t gonna be a challenge coming up. Other than that the game is amazing! I've had the app for years and come back to it time and again to unwind. I enjoy it and wish for continued expansion of colors and patterns. 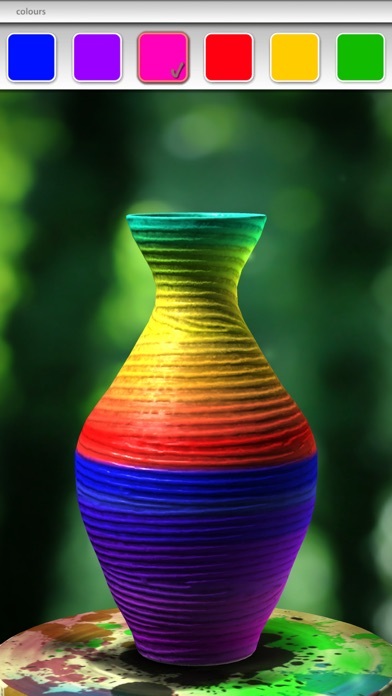 I find those that create pottery think less of it, but for this mortal that lacks artistic ability, I can impress myself with many beautiful pieces that can be created with this app. The app is extremely creative and i enjoy that you can share your work with others and also see theirs. I wish there were more “quests” to do with all the different styles available...id like to have some trigger when you purchase premiums or even different materials. Otherwise its very enjoyable just creating. This game is so much fun it keeps me busy for hours! I love the nature sounds and it really looks and feels like you make antique pottery and sell it! I love this app. It is so fun to use. I love the options, but I would change it so there would be more color options. Also you need to be able to skip over challenges that are too hard for you. I got my third challenge and I’ve been stuck on it since. Also, once you buy everything there is nothing left to buy. 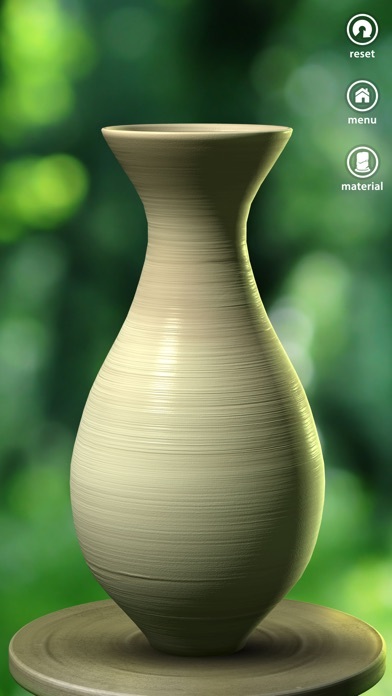 It might not be worth paying for, but overall I love the app and enjoy “making” pottery. I purchased the app for $5, no painting available! I LOVE THIS GAME SO FREAKIN MUCH!!!! I HIGHLY SUGGEST IT!!! To the users because those who run this app do not listen or care what the users want. This app is fun and you will waste a lot of time using it. But after a while it does get boring and using the same patterns over and over for a very long time, well thats why even the best potters stop using it. I never could figure why there can’t be so many different designs that you could never hope to use every one of them but it never happens. I stopped potting 3yrs ago and nothings changed. No new designs. I played for quite a while and there was one time they gave us new designs and then it was only a few. Also voting. If you get this app vote for pots you like, not for the person. There were other gripes but not so bad and ive forgotten what they were. Don’t purchase. Once you finish the 23 orders that's it. I'm very disappointed that this update doesn't have any changes in that area. Everyone has been asking and it still hasn't happened. I’ve had the app for several years and it’s never updated to include more orders. This is a relaxing game. Would like if you could close out the photo of a “want” from the emails.... And I Agee with others! Through the various updates, additional colors and types of pottery could be Madelynne well as additional brushes. I absolutely love this game. I’ve always loved pottery but I rarely get the opportunity to do it. This game is a fantastic alternative. It’s so addictive and I can’t stop playing it! This game is very relaxing, exiting, and amazing. It's fun has spread an addiction to all my family! Defiantly five stars! I have spent HOURS creating interesting pieces of pottery!! So much fun!! Could it be more? There's always room to grow -- I would like the freedom to be able to change the color of brushes, & I would like to create vertically -- but in the meantime, I'm having a lot of fun! Thanks!! It would be better if you could get your 💰 back it was not worth my time. This is my game de jour.... whenever I have wait times in a car (when I’m a passenger), or in the airport, I create pottery. Just brilliant!!! How many times do you have to pay for this app? This is the 3rd time I’ve paid for it and not only that, each time, I’ve lost all progress and content I’d purchased. I’m wondering if they delete all purchased apps that haven’t been used for a while. It’s a fun app but too expensive when you have to re-purchase it. I haven’t seen a game i like a lot in a while, and i mean a lot. This game is almost realistic. Those of you who want this game, try playing the lite (free) version of this game to see what this game to do. I don’t do pottery but i still like this game and you might to. I find this app very relaxing and fun. I very rarely pay for extra in apps but I love this app so much I find myself getting extra patters to help keep up my creativity. I love this game!, it’s so fun! I got this along time ago! Everyone who sees it loves it! My only problem is that the premium stuff isn’t worth over 200 coins! This app will eat your battery just as much as inhale and exhale. Waste of money, don’t download it. After using it for half a day I had to remove it because my iPhone 6s Plus died after only having used it for about two hours fully charged. App runs in background even after it had been closed. I just upgraded this app and lost all of my coins and collections I had created to be sold. What is with that? I’m really disappointed. How do I transfer everything I had from the free app? Can’t retrieve premium brushes etc. I switched to a new phone and apparently I have to start over with all the extra stuff I purchased. Very irritating. Won’t recommend this app anymore. Hats off to the developer for an incredible app. The modeling and application of colors and designs gives you the feeling you are creating works of art. The whole process from start to finish is awesome. Highly recommend it! Fun program. My kids and I love it! It’s so relaxing to create pottery without the mess of cleaning up afterwards. Bidding war at the end is a nice touch! The challenges are fun! I think there should be a random challenge option that will always give a challenge while waiting for the app to come out with more "email" challenges. The game is really well made and let’s you bring out creativity. 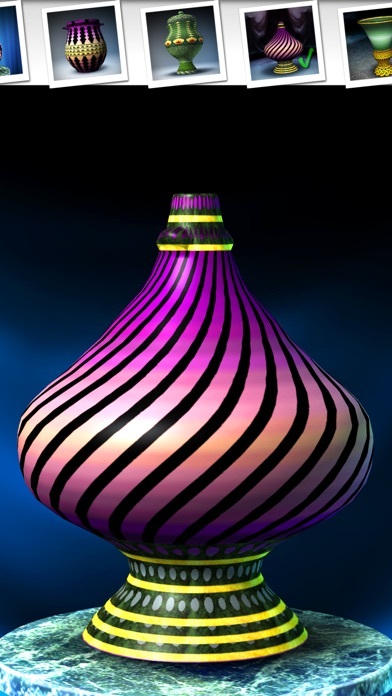 The only problem is that they never add more “brushes” to the game or colors, so you eventually have trouble thinking of new designs things to create. I also think it would be cool if you could not just make strips, but draw on your “brush.” I feel like that would kill two birds with one stone. The app is really great though. Just play for free. Not only did I waste the money on this app but I stupidly spent money thinking I was purchasing actual brushes and colors when in reality all I was doing is paying to unlock them and still needed to make a ton of pots to earn enough coins to use them. If I'm spending actual money I should actually get the brushes and if I don't them clearly and boldly label these premium features so people know what they're getting. I very rarely spend money on apps but I really liked this one and now I'm just angry and don't even want to play it anymore. Shame on the developers for milking every last drop out of their customers. Good job. It’s a nice game, fun brings out the artist in you, but once you buy everything, you run out of designs to use, could have more colors and designs. All my premium purchases are gone!!! The free version was interesting but there were no materials so I bought this. The paid version isn’t worth one penny. IMHO I WANT MY MONEY BACK! Exactly what I want an app to do: help me unwind and be creative. Perfect for not only just me but my five year old loves creating pots also. I think it’s even possible to buy the pots you create, but I haven’t looked into that part yet. I gotta go - I gotta get back to the Pottery app. I played this game years ago and recently re-downloaded it because it was so fun back in the day. One thing though, it literally has not been updated once in the past 7 years! I would like to see new designs and other features to get creative with. The whole reason I originally stopped playing was because I had beat it and I got super bored with it. This is the best graphics,most interesting app I've ever came across! I’ll be brief, every time I go to purchase a premium item, it tells me to restore my purchases(regardless of the fact that I have never purchased anything from the game at all) but when I do attempt to restore my purchases, it fails to do so. In the time since this problem arose, I have changed my internet provider and reset my iPhone completely, leaving it a blank slate. Unfortunately however it still happens. Please fix this issue as this problem prevents you from earning revenue. Thank you for your time. This games is so amazing. You can make whatever you want and be creative with it. It is like a pottery simulator. Not only is the gameplay and quality perfect, but the music and sound effects are relaxing and calming. Pleassssseeeee play this game!!!!!!!! 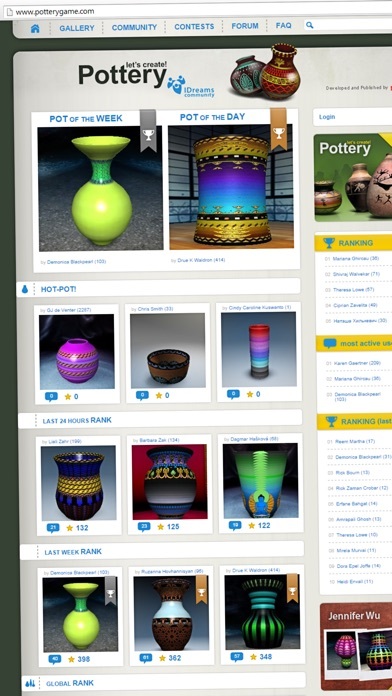 Even if you are the most inept pottery person in real life, this virtual pottery program will make you an expert potter in no time. I would like to suggest two improvements, however. First, I would really love a way of storing favorite shapes once they have been “fired” so I do not have to try recreating them if I want to try a different decoration scheme. Second, there has to be a better way of finding my pot in the zillions that are posted because I’d like to see if/how many people liked it. Trying to find one in the zillions is time consuming and frustrating. Their than those two items, I love this app even with its limitations regarding blending and lack of vertical coloring ability. Boring updates and few designs. I can’t do all that it says I can? I am disappointed to say the least!! All I can do is play with the clay, can’t paint it!!!! Crap!!! This game allows me to express my feelings with pottery. If you’re charging money for an app that has quests, they shouldn’t end. Updates should be frequent with new quests. Good game but how can you validate a standstill in game play? I love this app, it’s really calming and fun to use, but a couple recommendations are making a sorta free type mode. Like a mode where you can use all the materials and brushes and colors just to create, like it won’t affect your money or anything. It would be just to have fun. Also could there be a setting that makes it so the background doesn’t move? It feels weird. I am not generous with my stars. I love, love, LOVE ceramics. This game may not be a perfect portrayal of what it’s like to make pottery on a wheel, but... it IS one of the closest things I have to the real thing right now. This game is not only interesting with the challenges that it presents, but it is also very stimulating to try to impress the auction crowd with my own creativity. In short... this game is worth five stars. 3D Print option does not work, plain and simple. I often get those offers to copy a design for which the brushes are not available so you can’t complete the assessment. There are only a few packages of brushes which can be purchased and I’ve bought all of them. I keep hoping for new premium packages. Good: fun, interesting, creative outlet, well done in some respects Hey, designers! Why are you not adding more brushes and colors to buy with our points? I earned points for all of them a couple of years ago. We buyers work to perfect daily assignments to earn points but never have new colors or brushes to buy. Seems pointless to work for points and not be able to use them. Also-- periodically there are brushes in the assignments that aren't in the arsenal-- and I have all of the brushes. That's frustrating. Doesn't happen often, but still-- it's frustrating when it does. Where are you getting those missing brushes? Are there some that you've forgotten to put in the store for us to buy? When I bought the game, I was promised more challenges in the inbox thanks to some unnamed aunt. So I went through all the challenges now what? Don't get me wrong, the game is great and throwing clay in this vile experience is hands down amazing. But how can you claim to be "infinite" if the challenges just disappear? Low rating for the false advertising. I ran out of challenges to do, when are they adding more! I paid for the app and bought all premium items but I have no more emails to do and I’m not even a week in. $4.99 plus the premiums and no more to do? It’s the best game I’ve ever played, until I passed every challenge. I’m seeing this in quite a few reviews. If you’re working on them please let us know. If not then I will uninstall, chalk up the lost money and give a 1 star review for not being worth buying. Only play the free game. You can do all of the challenges with the free game in the same time frame that I did. I love the game but found it frustrating that changing from an android to iPhone I lost the brushes that I purchased. I have spent many hours playing this game . I would rate it 5 if I could just have the brushes back. Same thing happened to me. I had an Android. It went belly up. Lost everything. Lost every purchase I had made with this app. I had them all, all the colors, ornaments, brushes etc. All gone. Never to return. I will still give it 5 stars but, no longer recommend it to anyone. Have started over from the beginning. The extras cost way too much, but it's addicting and fun. I won't buy any more extras because I feel that the developers are taking advantage. Yes, I get it, you have to make a living, but with how many reviews you have I'm sure you could do so with lower cost extras. At least throw in some freebies now and then. Loved this game at first, had all the colors and patterns and paid for other things. Then I got a new iPad and it’s all gone. GONE. There’s no way to retrieve all my stuff. I have the same account too. Waste of money and time! This game is really cool and really fun to play. Can you make different kinds of pottery types like bowls and plates please that would be really cool if you did that. I'm so addicted to this game. I love all of the different tasks and how you can just be creative too. Love it ! Add more features please ! This game is very VERY addicting I play it almost every day if I have time. Please create more design content. Please!